1. B Carbonates are insoluble when paired with iron. Iron has a charge of +3 and carbonate has a charge of −2. To cancel out, both charges need to have a magnitude of 6, requiring two iron atoms and three carbonate ions. The best representation of that is choice (B). 2. D When those solutions mix, a precipitate of AgCl will form, removing those ions from the solution. The remaining ions (K+ and NO3−) do not react and remain the same as they were when they started. 3. D The precipitate that would form is PbCl2, meaning that both NO3− and Na+ are spectator ions. The precipitate would require twice as many chloride ions as lead ions. Therefore, if equal moles of both are used, the NaCl would be the limiting reagent, and almost all of the chloride ions would be present in the solid, with very few left in the solution. There would, however, still be significant Pb2+ remaining in solution, as it is in excess. 4. C Via the information given from the solubility rules, we can determine that the precipitate would be copper (I) carbonate, which has a formula of Cu2CO3. In the net ionic equation, spectator ions (in this case, K+ and Cl−) cancel out and do not appear in the final reaction. 5. C Z2+ was able to reduce to solid Z by taking electrons from metal X, so Z must have a higher reduction potential than X. Y2+ was unable to take electrons from metal X, and therefore Y must have a lower reduction potential than X. 6. A In an endothermic reaction, energy must be absorbed by the reactants for the reaction to occur. This is because the amount of energy necessary to break the bonds of the reactants is greater than the amount that is released by the formation of the bonds in the products. 7. A In (D), chromium is a pure element and has an oxidation number of 0. In (C), chromium’s oxidation number is equal to its charge of +3, and in (B) it must balance the −2 on the oxygen, so it has a charge of +2. In (A), the total charge on the ion is −2, and each oxygen is −2. Solving the following, where X is the oxidation number on chromium: X + −2(4) = −2. So, the oxidation number is +6. 8. D An activated complex occurs when the bonds of the reactants have broken, but before the bonds in the products have formed. The level must always be above those of both the reactants and products. Choice (A) is true for endothermic reactions, and choice (B) is true for exothermic reactions, but neither option is correct for all reactions. 9. D The empirical formula of boron trifluoride is BF3. So the mass ratio is about 57 to 11, which is about 5.3 to 1. 10. A The reaction will stop when no more precipitate can form, which will occur when either magnesium or phosphate ions run out. As there are no excess phosphate ions in solution after the reaction, the potassium phosphate must have run out first, leaving excess magnesium ions unreacted in solution. Every mole of Ca(OH)2 contains 2 moles of oxygen. 12. A Assume that we have 100 grams of the compound. 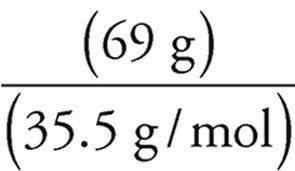 That means that we have 31 grams of oxygen and 69 grams of chlorine. So the ratio of chlorine to oxygen is 1 to 1, and the empirical formula is ClO−. 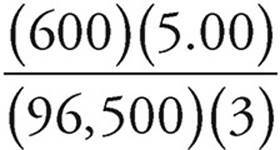 Note that even without a calculator, you are expected to be able to do simple calculations such as the ones above. 15. A Pressure is a measure of how much force the gas particles are hitting the container walls with. An increase in temperature is indicative of increased molecular velocity. If the molecules are moving faster, they will not only have more energy when they hit the container walls, but they will also hit those walls more often. Both of those factors contribute to the increased pressure. 16. D A catalyst does not change the amount of bond energy present in either the reactants or the products, and catalysts always speed up the overall reaction. Many decomposition reactions occur more quickly with a catalyst, but even without one present, the reaction can progress, albeit at a slower rate. 17. 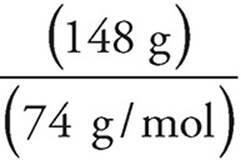 C The molecular weight of CuSO4 is 160 g/mol, so we have only 1 mole of the hydrate. The lost mass was due to water, so 1 mole of the hydrate must have contained 90 grams of H2O. So if 1 mole of hydrate contains 5 moles of H2O, then the formula for the hydrate must be CuSO4 • 5 H2O. 18. B Use trial and error or backsolve. Start with (C). If there are 3OH−, there can’t be a whole number coefficient for H2O, so (C) is wrong. You should also be able to see that the answer can’t be an odd number, so (A) is also wrong. Try (D). If there are 4OH−, then there are 2H2O. That leaves 2 more Os on the product side, so there must be 2CNO−. If there are 2CNO− then there are 2CN−. These are all whole numbers, but they are not the lowest whole numbers, so (D) is wrong. If we divide all the coefficients by 2, we get the lowest whole number coefficients. That leaves us with 2OH−, which is choice (B). By the way, N5− (in CN−) is oxidized to N3− (in CNO−), so there are 2e−. 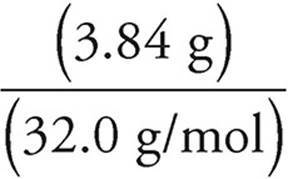 From the balanced equation, for every mole of CaCO3 consumed, one mole of CO2 is produced. So 1.5 moles of CO2 are produced. 20. B All of the reactants are consumed in the reaction and the temperature doesn’t change, so the pressure will change only if the number of moles of gas changes over the course of the reaction. 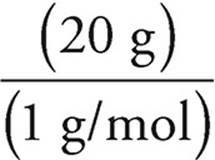 The number of moles of gas (3 moles) doesn’t change in the balanced equation, so the pressure will remain the same (2 atm) at the end of the reaction as at the beginning. 21. D Let’s say we have 100 grams of the compound. According to our rough calculation, there are about three times as many moles of hydrogen in the compound as there are moles of carbon, so the empirical formula is CH3. 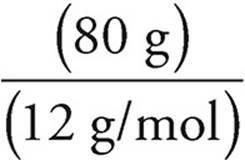 The molar mass for the empirical formula is 15 g/mol, so we need to double the moles of each element to get a compound with a molar mass of 30 g/mol. That makes the molecular formula of the compound C2H6. 22. C The oxidation numbers of the reactants are Cr6+, O2−, I−, and H+, and the oxidation numbers of the products are Cr3+, O2−, I0, and H+. Chromium gains electrons and is reduced, and iodine loses electrons and is oxidized; the oxidation states of oxygen and hydrogen are not changed. 23. C In a molecule, the more electronegative element takes the negative oxidation state. Hydrogen is more electronegative than calcium, so the oxidation state for Ca is +2 and the oxidation state for H is −1. In choices (A), (B), and (D), hydrogen is the less electronegative element, and it takes the oxidation state of +1. 24. C The oxidation state of hydrogen remains +1 throughout the reaction. We have O− at the start. When water forms, oxygen has gained an electron and been reduced to O2− (GER). When O2 forms, oxygen has been oxidized to O0 through the loss of an electron (LEO). As you can see, in this process, oxygen is both oxidized and reduced. 25. 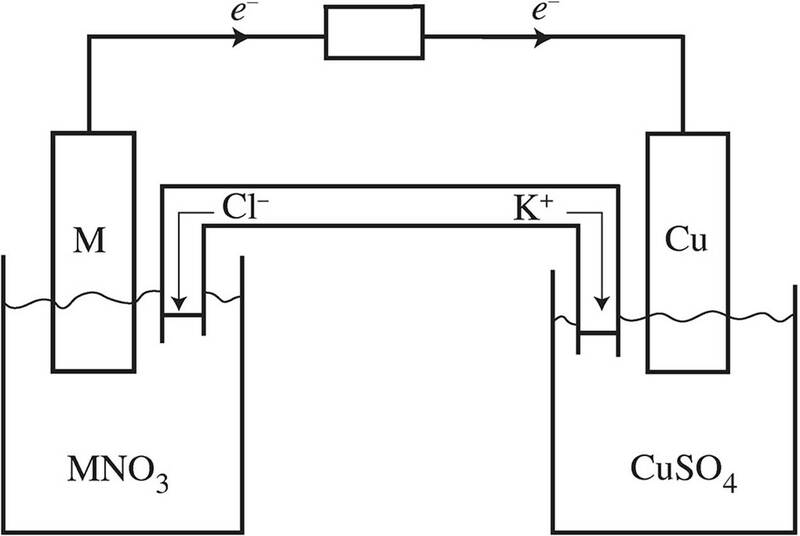 A We add the reduction potential for Fe2+ (−0.4 V) to the oxidation potential for Cu (−0.3 V, the reverse of the reduction potential) to get −0.7 V.
26. D To get the reaction potential, we add the reduction potential for the reduction half-reaction to the oxidation potential for the oxidation half–reaction. Here are the reaction potentials for choices (A)−(D). Choice (D) is the only reaction with a positive voltage, which means that it is the only reaction listed that is favored. 27. C First let’s find out how many electrons are provided by the current. So we get as many moles of Al(s) as we have moles of electrons. 28. B The Pb half-cell has a greater reduction potential than the Cr half-cell. Pb2+ will be able to take electrons from the Cr(s) solution, and reduce to become Pb(s). The Cr3+ ions are on the products side of the reaction, and the reaction would shift left, reducing the overall voltage for the cell. 30. D As the reaction progresses, Pb2+ is being reduced to create Pb(s). This decreases the amount of positive charge in the solution, which is replaced by the Na+ from the salt bridge. At the anode, excess Cr3+ is being created, which is balanced by the Cl− anions from the salt bridge. 31. A For a reaction to occur, the reduction potential of the ions in solution must exceed the reduction potential for the ions of the corresponding metal. If Cr(s) were placed in a solution containing Pb2+, the Pb2+ would take electrons from the Cr(s) and create Pb(s) and Cr3+. 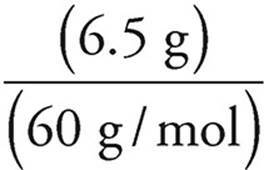 (b) Use the ideal gas equation to find the number of moles of CO2 produced. Remember to convert to the proper units. 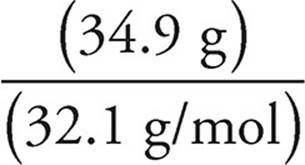 From the balanced equation, for every mole of CO2 produced, 1 mole of CaCO3 was consumed. So 0.035 moles of CaCO3 were consumed. (c) We know the number of moles of CaCO3, so we can find the mass. 2. (a) All of the hydrogen in the water and all of the carbon in the carbon dioxide must have come from the hydrocarbon. Every mole of water contains 2 moles of hydrogen, so there are 0.240 moles of hydrogen. Every mole of CO2 contains 1 mole of carbon, so there are 0.080 moles of carbon. There are three times as many moles of hydrogen as there are moles of carbon, so the empirical formula of the hydrocarbon is CH3. 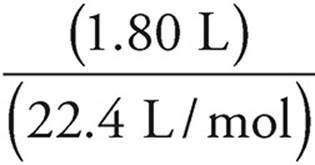 (b) In (a), we found the number of moles of hydrogen and carbon consumed, so we can find the mass of the hydrocarbon. (c) First let’s find the number of moles of hydrocarbon from the ideal gas law. Don’t forget to convert to the appropriate units (760 mmHg = 1 atm, 32°C = 305 K). 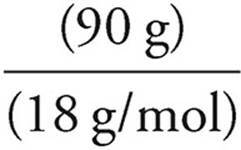 Now we can use the mass we found in (b) to find the molecular weight of the hydrocarbon. CH3 would have a molecular weight of 15, so we can just double the empirical formula to get the molecular formula, which is C2H6. 3. (a) First find the molar mass of Cu2S. 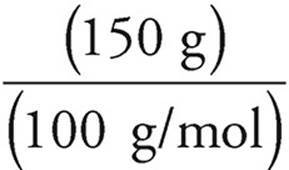 (b) Assume that we have 100 grams of ore #2. So we have 34.6 g of Cu, 30.5 g of Fe, and 34.9 g of S. To get the empirical formula, we need to find the number of moles of each element. So the molar ratio of Cu:Fe:S is 1:1:2, and the empirical formula for ore #2 is CuFeS2. 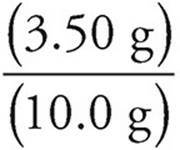 (c) You can use the ratio of the percents by mass. (d) First find the moles of O2 consumed. From the balanced equation, for every 3 moles of O2 consumed, 6 moles of Cu are produced, so the number of moles of Cu produced will be twice the number of moles of O2 consumed. So 0.240 moles of Cu are produced. 4. (a) We need to find the limiting reagent. There’s plenty of water, so it must be one of the other two reactants. 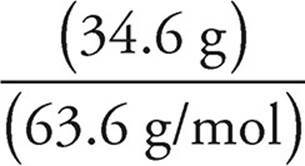 From the balanced equation, Mg and CuSO4 are consumed in a 1:1 ratio, so we’ll run out of Mg first. Mg is the limiting reagent, and we’ll use it to find the yield of H2. 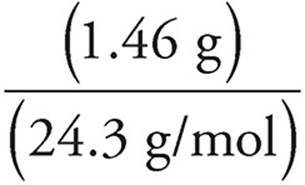 From the balanced equation, 1 mole of H2 is produced for every 2 moles of Mg consumed, so the number of moles of H2 produced will be half the number of moles of Mg consumed. (b) Mg is the limiting reagent, so some CuSO4 will remain. 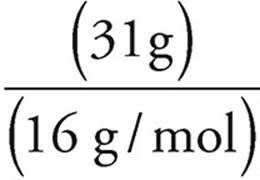 From the balanced equation, Mg and CuSO4 are consumed in a 1:1 ratio, so when 0.060 moles of Mg are consumed, 0.060 moles of CuSO4 are also consumed. 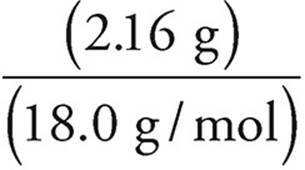 (c) From the balanced equation, 1 mole of Cu2O is produced for every 2 moles of Mg consumed, so the number of moles of Cu2O produced will be half the number of moles of Mg consumed. 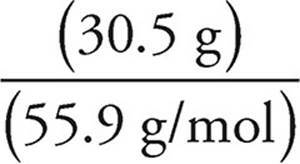 (d) All of the Mg consumed ends up as Mg2+ ions in the solution. The reduction potential for metal M is the opposite of its oxidation potential. (c) Reduction occurs at the cathode, so copper is the cathode. Oxidation occurs at the anode, so M is the anode. Electrons should be flowing from metal M to the copper bar. In the salt bridge, the K+ ions will flow towards the copper solution to replace the Cu2+ being reduced into Cu(s). The Cl− will flow towards the solution for metal M in order to balance out the charge of the extra M+ions being created via the oxidation of M(s). (e) If the concentration of the Cu2+ increases, it will cause a shift to the right in accordance with Le Châtelier’s principle. This will increase the cell’s overall voltage. 6. (a) The two potential reduction reactions are the bottom two, as their reactants (H2O and Ni2+) are actually present at the start of the reaction. Of the two, the nickel reduction is more positive, and thus will take place. The top two reactions must be flipped to have the reactants (H2O and F−) on the reactants side, which also flips the sign. the sign the water oxidation will have a more positive value and thus will occur. (b) At the cathode, solid nickel would begin to plate out of solution. At the anode, oxygen gas would form and bubble up to the surface.